The kids are going to be featured this Saturday, Jan. 23, as they can be fishing in the morning and serving (and eating) chowder at night. Beginning at 9 a.m. on Saturday at the Boca Grande North Fishing Pier, kids 15 and under can participate in the youth fishing tournament, sponsored by Lee County Parks and Recreation and the Boca Beacon. Children should be accompanied by an adult and bring their own rods and tackle – bait is provided by Boca Grande Marina. Fishing ends at 11 a.m., and awards and a raffle will be held right afterward. There is no charge for entry. 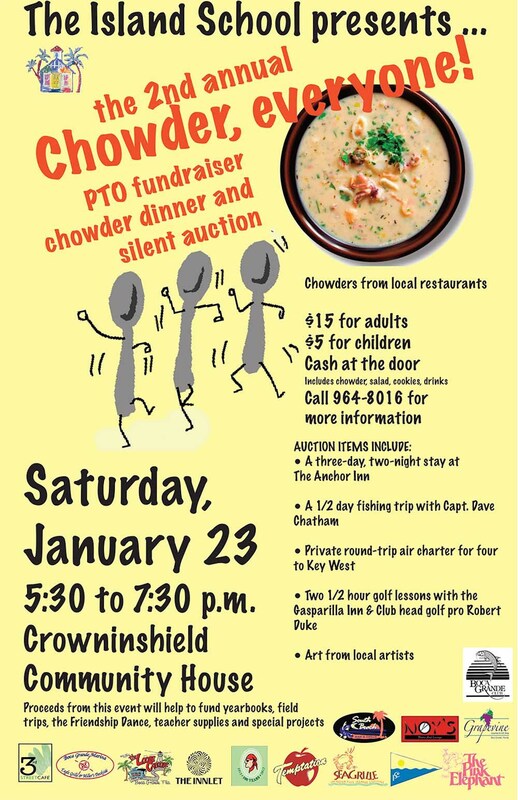 Then on Saturday evening from 5:30 to 7:30 p.m. at the Crowninshield Community House, The Island School will be holding their major PTO fundraiser of the year, their second annual chowder dinner and auction. 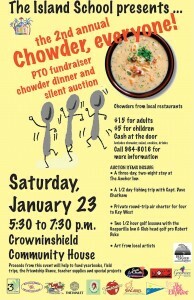 The cost for chowder, salad, cookies and drinks is $15 for adults, $5 for children (cash at the door). Auction items include a three-day, two-night stay at The Anchor Inn, right here on the island; a half-day fishing trip with Capt. Dave Chatham; private round-trip air charter for four to Key West; two half-hour golf lessons with the Gasparilla Inn & Club head golf pro Robert Duke and art from local artists. Restaurants participating in the chowder dinner include 3rd Street Cafe, Eagle Grille/Miller’s Dockside, The Loose Caboose, The Innlet, The Gasparilla Inn & Club, The Temptation, PJ’s Seagrille, South Beach Bar and Grill, The Boca Bay Pass Club, The Pink Elephant, Noy’s Bistro and Lounge, The Grapevine and the Boca Grande Club. Proceeds from the event help to fund yearbooks, field trips, the Friendship Dance, teacher supplies and more. Call 964-8016 for more information.